In 1895, the architect Krasovsky redesigned the former dining room on the 2nd floor of the Winter Palace into a library for Nicholas II in the gothic style. Walnut was used throughout: ceilings, upper gallery, walls with dark red embossed leather and gilt wallpaper, and furniture. 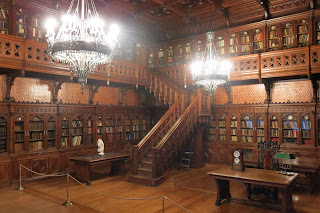 There were two ‘Gothic’ chandeliers adorning the library. It is unknown if they were specifically designed for the room or purchased from a company. By the 1930s, they were lost and no record has been found if they were dismantled or sold. From 1840s until 1917, chandeliers were encased in special woven covers and uncovered and lit only when the Emperor was in residence. They were hung low to be seen whereas today the remaining original chandeliers are near the ceiling. 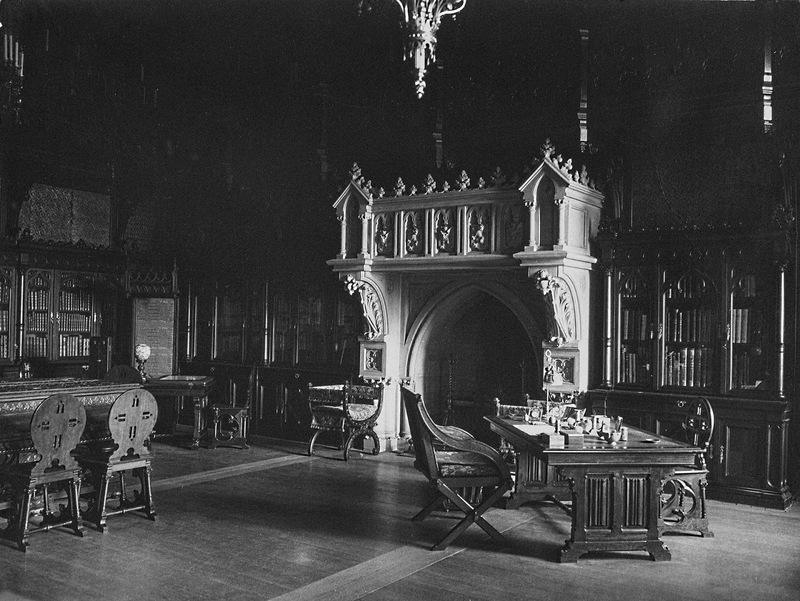 After the loss of the original chandeliers in the Gothic library, staff placed old stained glass ones that disintegrated after time and then used modern globes. Recently, the Hermitage unveiled replicas of the Gothic chandeliers by the architect Tatiana Kargina. Sales of Imperial property from the palaces took place during the 1920s-1930s of which the most well-known were Fabergé pieces and paintings. Chandeliers were also sold. In 1937, Marjorie Merriweather Post’s husband Joseph Davies was appointed U.S. Ambassador to Russia. The couple went on a buying spree in Moscow and Leningrad collecting Imperial treasures. There are today two chandeliers in Hillwood Museum, Post’s former home in Washington, that are identified as Imperial Russian with unconfirmed provenances. 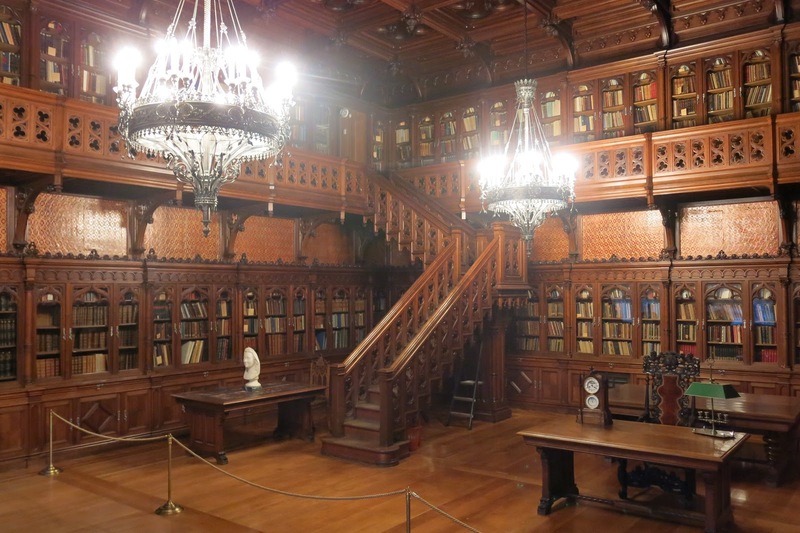 Were the chandeliers in Nicholas II’s Gothic Library sold during the 1930s and the current owners unaware of its provenance? So glad the library's chandeliers have been recreated. 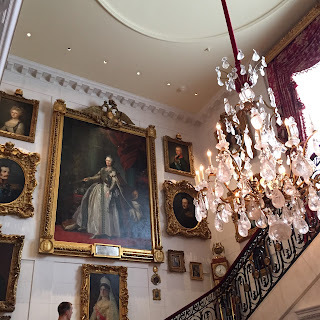 The breakfast room chandelier reminds me of Pavlovsk. 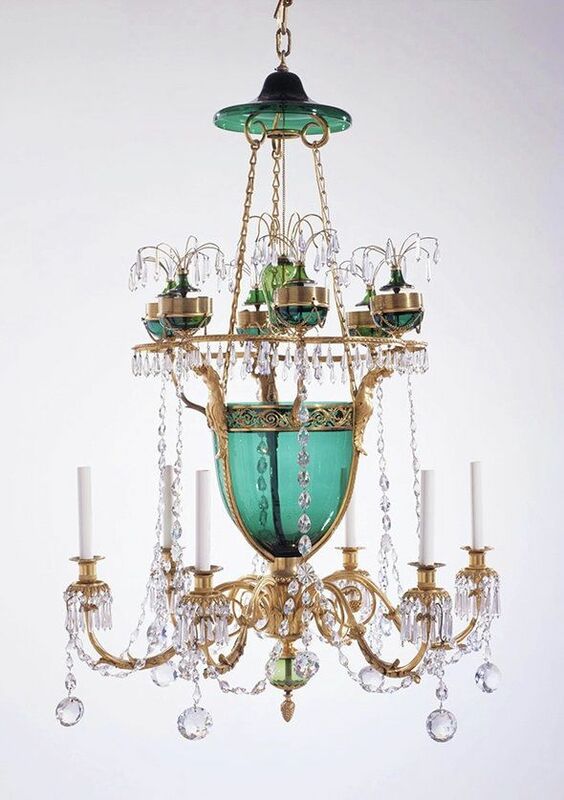 There was an article that another had referenced from years ago that said there was a Pavlovsk chandelier in Trump's Mar-a-lago, the former estate of Mrs. Post. I haven't been able to confirm but I am wondering if it had been returned to Hillwood after the sale of Mar-a-lago. Joanna, question for you that has perplexed me...what did the door at the top of the stairs in the Gothic Library access? Seems like a prominent door at the very top of the stair vs. a hidden jib door in a less noticeable location. The stair seems more intended to access this room first and the upper mezzanine second per it's design. Was it used in a formal way attached to the library function (i.e., storage for light sensitive papers or office for the librarian vs. maybe mechanical for the bathroom below)? The door led to the mezzanine rooms that were built above Nicholas' private study, dressing room and bathroom. The mezzanine floor is still there today. I didn't know this mezzanine floor extended that far. Do you know what these rooms were used for? Do you have any plans of these mezzanine floors sandwiched between the ones you have already posted? I have seen the various mezzanine floors that were (and some remain) on the 1st and 2nd floors. Mezzanines were also on the 3rd floor. Since the mezzanines were added at different times during reconstructions from 1840 until 1902, plans were numerous. The one for Nicholas II was for his wardrobes. That First Photo (Gothic Library 1917.jpg) leaves me Speechless!